The Oaks Border Medium Table Lamp has a Tiffany shade with a vibrant, floral design. The Oaks Border Large Table Lamp has a Tiffany shade with a vibrant, floral design. The Oaks Border Small Table Lamp has a Tiffany shade with a vibrant, floral design. The Oaks Butterfly Medium Table Lamp is in a pretty, delicate Tiffany style design. The Oaks Butterfly Large Table Lamp is in a pretty, delicate Tiffany style design. The Oaks Butterfly Small Table Lamp is in a pretty, delicate Tiffany style design. The Interiors 1900 Butterfly Medium Tiffany Table Lamp combines flowers and butterflies in colourful art glass. 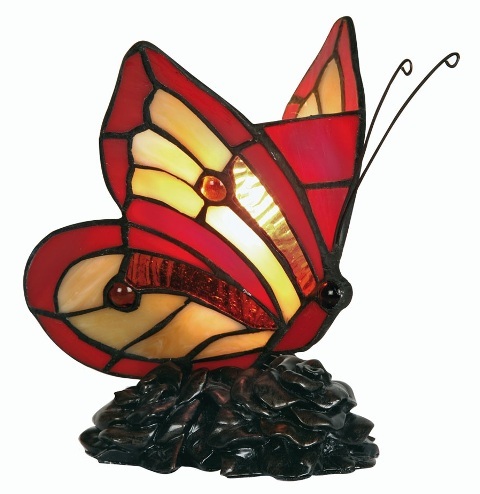 The Oaks Butterfly Tiffany Table Lamp is a brightly coloured butterfly table lamp on a resin base. The Interiors 1900 Butterfly Small Tiffany Table Lamp combines flowers and butterflies in colourful art glass. The Oaks Caius Medium Tiffany Table Lamp has a colourful glass shade with a scalloped edge. The Oaks Camillo Large Tiffany Table Lamp has a floral glass shade and an Antique Brass finish base. The Oaks Camillo Small Tiffany Table Lamp has a floral glass shade and an Antique Brass finish base. The Oaks Camillo Tiffany Bankers Lamp has a floral glass shade and an Antique Brass finish base. The Oaks Cat Table Lamp resembles a sleeping cat in white glass with coloured accents. The Interiors 1900 Clematis Tiffany Table Lamp depicts flowers weaving through trellis in shades of Pink and Purple art glass. The Oaks Cordelia Tiffany Table Lamp has a bell shape Amber and Red leaded glass shade. The Oaks Dog Table Lamp is in White glass with coloured accents. Hand made in England from soild brass table lamp complete with tiffany scale 40cm iridised blue glass champagne shade. Hand made in England from soild brass table lamp complete with tiffany glass scale 40cm amber shade. Hand made in England from solid brass table lamp complete with tiffany glass mushroom scale amber shade. Hand made in England from solid brass table lamp complete with tiffany glass scale pink shade. Hand made in England from solid brass table lamp complete with tiffany 8 panel iridised white glass shade. Luxury Lighting supply a vast range of Tiffany lamps to suit all styles. 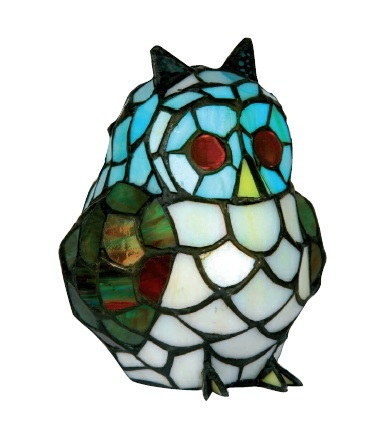 These quality Tiffany lamps come in modern and traditional styles and are available in many colourful designs, that will grace your home for many years. Tiffany lamps create a wonderful feature piece and can provide a warm cosy atmosphere in any room of the home. Working with the leading manufacturers of Tiffany lamps enables us to offer a great choice at affordable prices.